Chinese President Xi Jinping (L) and Indian Prime Minister Narendra Modi, arrive for the 'Dialogue of Emerging Market and Developing Countries' on the sidelines of the 2017 BRICS Summit in Xiamen, Fujian province, China, 05 September 2017. 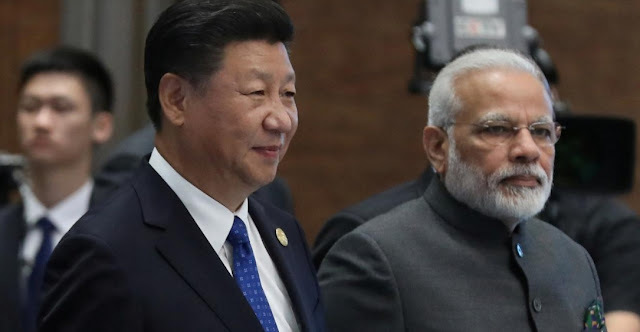 XIAMEN, China - China wants to put its relationship with India on the “right track”, President Xi Jinping told Prime Minister Narendra Modi at a meeting in Xiamen, the official Xinhua news agency reported on Tuesday. Xi told Modi that healthy, stable ties were in the interests of both countries, Xinhua said, in a meeting on the sidelines of a summit of BRICS countries. It was the second time the leaders had met in three months, but the first since a tense Himalayan border standoff that was the most serious military confrontation between the two countries in decades. The standoff between Chinese and Indian troop in the Doklam border region ended about a week ago, in time for the BRICS summit of emerging economies, which also includes Brazil, Russia and South Africa. The quiet diplomacy that ultimately ended in de-escalation was based on a principle of stopping “differences becoming disputes” that Modi and Xi had agreed in Astana in June at their last meeting. China has since sought to cast its ties with India in a positive light, saying there was huge potential for cooperation between the giant neighbors. The prospect of the Xi-Modi meeting had raised hopes they will try and repair a relationship that has deteriorated as the two countries find their interests diverge - and often clash - while competing for influence across Asia. Ties remain strained over the disputed frontier and India is deeply suspicious of China’s growing military activities in and around the Indian Ocean. China has said its forces will continue to patrol in Doklam, which is claimed by Bhutan, and that it hoped India had learned a lesson from the incident.